Imagine stretching your legs as you watch a blockbuster, sinking further into your plush seat at the PVR Director's Cut in the Capital. While DC changed the movie-going experience by elevating it to uber luxury, the introduction of Simply Sushi by the same group this October, promises to redefine your food experience while watching a film. 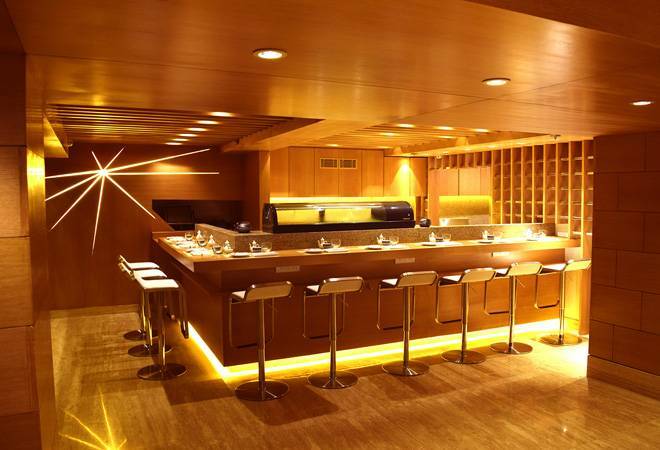 Located in a small space between the brand's multi-cuisine restaurant Mistral and the auditorium, Simply Sushi comprises a small island which works as an open kitchen, with comfortable stools placed along it for easy dining. The menu is limited but extremely well curated and we have to say, the sashimi and sushi is at par with the best in the city and at half the price. We only hope the pricing remains competitive over time as that will undoubtedly be its biggest draw. Ordering from here is easy as you just need to tick your order on a form menu, specifying quantity alongside. Beautiful lacquer bento boxes (no cheap plastic or messy paper cartons here to contend with) with your choice of sushi/ sashimi are then sent to your seat inside the theatre. How is that for wow? My only concern is, the food is so fantastic that chances are, I would be more focused on devouring my bento box than watching the film! We decided to skip the movie altogether and spent a wonderful evening in the company of Chef Saito, the man responsible for the exceptional, boutique menu. 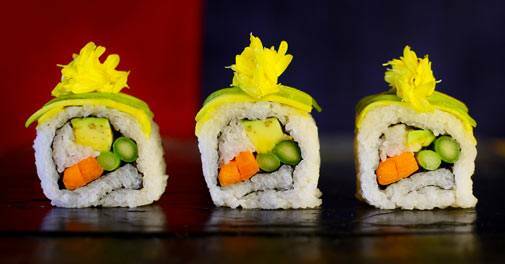 He has spent four years at Megu at The Leela Palace, Delhi, and knows his rolls better than most. It also helps that he has been in India for a reasonably long period of time, and understands the nuanced Indian palate. Begin your meal with a cup of steaming green tea poured from an elegant earthenware kettle. The appetiser section alone allows you to explore a range of flavours and textures and from the fine quality avocados used to prepare the avocado tartate served on a bed of fried sushi rice lightly flavoured with soy, to the carpaccios, the food climbs up the bliss zone and the flavours hum and then sing with ease. Other vegetarian options like the tofu spinach served with a creamy whit miso paste with a hint of soy and vinegar and rice crackers that add crunch to the dish are a revelation and all the ingredients are in harmony. The kampachi carpaccio or amberjack fish with slivers of garlic and fried mushroom is sliced elegantly and overall, the dish is respectful of the fish and its Japanese flavour origins. The maguro akami tataki is also a work of art, the fresh slivers of tuna sitting easy on a bed of seaweed flavoured with ponzu sauce. Truly delicious. 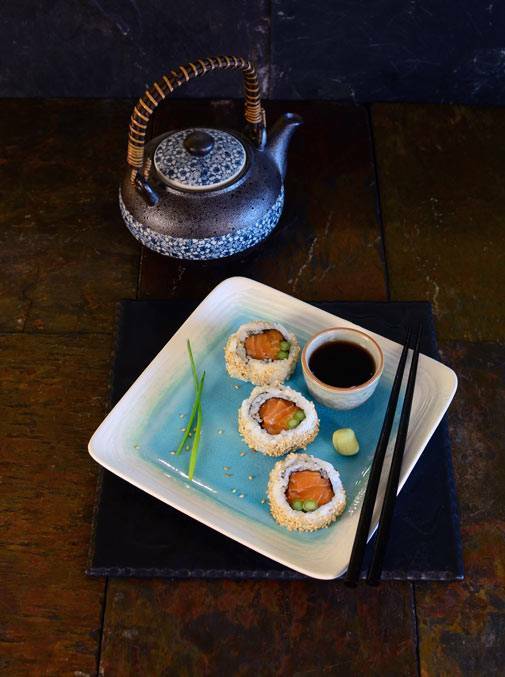 If you still have room for a taste of Japan, the California and salmon rolls are a must try. 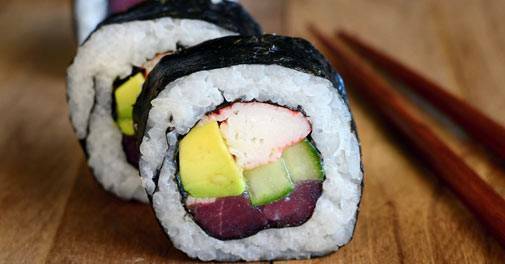 The sushi rice is light, the roll neatly put together and the overall experience, wonderful. Wash these down with the lightly flavoured miso soup, especially if here in winter. I eat a lot of sushi but can safely say that this is amongst the best Delhi has to offer. The intimate setting, complete focus on flavour and the top notch ingredients used make the experience at Simply Sushi irreplacable. Most of the produce is flown in from Japan while some of it is sourced locally, and it is obvious that this is the vision of a chef who understands these ingredients and presents them with utmost respect and love. Get your sushi fix at Director's Cut if you wish, but I would highly recommend an evening at the island table that is the sushi station. Japanese food never tasted so good and I am already planning my next meal.